Every once and a while, a truly mesmerizing record comes along, drags you out of the murky depths of an afternoon and elevates your spirit to heights you forgot it could reach. The power and scope of Astra’s new record “The Black Chord” is capable of providing the listener with just such an experience. The first journey through the album connects you to a serene place within your mind where all the limitations and barriers provided by the physical world cease to be relevant. Towering, primordial rhythms hypnotize the listener into a profound stupor. It’s more than a 70’s styled progressive rock album; it’s the musical equivalent of Satori. Hearing such an exquisite piece of music made me extremely curious as to the creative minds that brought it into being. Richard Vaughn and Conor Riley were kind enough to give Tyranny some insight into their creative process last week. They both contribute vocals on the recent album, as well using enough obscure musical equipment to keep Robert Fripp entertained for the better part of a century. Here’s a look inside their heads…. Tyranny: What does the name Astra mean to you? Conor: It was named after an album written by a South African band named Freedom’s Children. It’s a cosmic/spacey epic that we felt described our music. Richard: Yes, our name was originally inspired by the South African band Freedom’s Children. 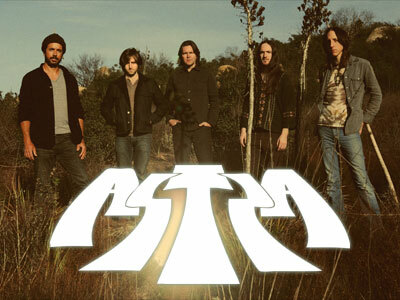 Their second album from 1970 entitled Astra has long been a favorite of ours. Also, the phrase “Ad Astra” is a Latin phrase meaning “to the stars” and seeing that we all find some inspiration in astronomy, science-fiction and cosmic music of all sorts, we found Astra to be a perfect fit. Tyranny: What is the experience of playing music like for you? Conor: It combines many different elements. When playing with the right musicians in the right frame of mind it can be transcendent, cerebral, emotional and spiritual. Richard: For me, playing music is very rewarding on many different levels. When a song finally comes together or a new part or riff is suddenly discovered during a jam, I always a feel this great sense of accomplishment and excitement. Playing music has also been very therapeutic for me. Like many people, I’ve gone through difficult times in my life and I’ve had to deal with some dark and heavy issues. Being able to get away and play, to escape within the music, really helped me to heal. Sometimes when we play as a group, during long, instrumental jams, I find myself in an almost trance-like, meditative state where I can just drift off. Tyranny: What is the point of creating art? Conor: I’m not sure that there is a point. I’m not sure that there’s a point to anything really. I think as humans, art is way to try to make sense of our existence and individuality. I don’t think it’s working; it seems to be pulling us in the contrary direction. Richard: I would think that the reason for creating art would be to get that particular voice, sound or vision out of one’s head and into the physical world, to express one’s self and to be able to see or hear their vision fully realized. For me, sometimes a melody or an idea will pop into my head or I could be listening to music and I’ll get a sudden urge of inspiration from what I’m hearing and I’ll need to stop what I’m doing, pick up my guitar and see where it goes. The thing is, the actual reason for creating art could be unique for everyone. Tyranny: What limitations do you face in putting forth your full creative vision? Conor: We are only limited by the biases of each other. As a whole we don’t hold anything back. Within the band we all have different views and musical tastes which doesn’t allow us to stray too far. Richard: A great thing about our label Rise Above Records is that they allow us full creative control of our music and they have never set any limitations on what we can do. Like Conor said, the only real limitations we have are the mutual criticisms, tastes and visions each of us has for our music within the band. We work together for the good of the music and sometimes that means shooting down an idea or reigning in a particular direction. We’re very honest with each other. Tyranny: What influences, be they musical, literary, or of any other medium, have helped you find your creative voice? Conor: Musically, I am most influenced by bands like Aphrodite’s Child, Freedom’s Children, Genesis and Comus. Richard: There are just too many to name! Musically, Aphrodite’s Child with their double LP 666 is still right up there towards the top of my list and has been for a long time. Everyone in the band has a special place in their heart for that album. There’s also Genesis, King Crimson, Yes, Mahavishnu Orchestra, Magma as well as a long list of early 70’s Italian prog bands, Krautrock, electronic music and even a lot of late 60’s psych rock and folk. I seriously could go on and on. What’s great is that, while we all love most of the same music, we each tend to gravitate towards our own specific favorites. The variety of all of these influences is very beneficial to our songwriting and sound. A book I read recently was a direct influence on the last song of our album. This sci-fi novel was published in 1969 and was written by Brian Aldiss. Entitled “Barefoot in the Head” it’s a futuristic, post apocalyptic tale of a world wide “acid head war” waged with PCA(Psycho-Chemical Aerosol) bombs. The aftermath left most of the world permanently dosed on LSD. As the main character is increasingly exposed to the drug, the narration and dialog become more and more fractured by mutating words, puns and phrases. I borrowed this writing style for the lyrics and used the influence of the book as a kind of metaphor for feeling as if you’re losing your mind. I was feeling this way around the time I was writing that song. This is good example of how music can be therapeutic for me. Tyranny: Salvador Dali once said, “Confusion is the best form of communication”. What are your thoughts on this quote? Conor: Maybe he was trying to say that by being confused it forces you to think critically to grasp for a deeper understanding. Perhaps sometimes that is the best way to convey a point. Richard: To me organization seems to be too simple, too linear or one dimensional and may only carry a single message. Chaos and confusion can be much more memorable by requiring a deeper thought process allowing for people to draw their own conclusions or to gather their own thoughts and meanings. Tyranny: What do you believe would be the highest complement you could possibly receive? Conor: Plagiarism and illegal downloads. Richard: Knowing that our music directly inspired or influenced someone in one way or another to do something creative or important. To do something positive. That would be a great complement. Tyranny: If you could be trapped inside one song for the rest of your life, what would it be? Richard: That would be a living hell! Trapped inside one, single song for the rest of my life, over and over again? I think that would be enough to drive a person mad. Don’t get me wrong, of course I absolutely love music but I do need to take a break from time to time. Once in a while I won’t even listen to any music for up to a week or more. A break like that can be very refreshing and it makes me appreciate music that much more when I come back to it. This entry was posted on April 18, 2012, 3:38 PM and is filed under People Who Were Willing To Speak To Me, Uncategorized. You can follow any responses to this entry through RSS 2.0. You can leave a response, or trackback from your own site. Hmm. Lacking any real insight into any of this, I will simply add a little factoid. Two famous uses of the Latin phrase “Ad Astra” is in the Royal Canadian Air Force’s motto, “Per Ardua Ad Astra (Through Adversity To The Stars)”. The other is on a little plaque on the launchpad where Apoolo 1 caught fire, killing thee astronauts – “Ad Astra Per Aspera” – or as NASA loosely translated, “A Rough Road Leads To The Stars”. Oh, and one other – the Astra is a currently semi-popular small European car built by Vauxhall/Opel, owned by GM. It is not to be confused with the Astre, Pontiac’s version of the ill-starred Chevy Vega from the 1970s.